On Thanksgiving I have a little tradition of watching both Planes, Trains, and Automobiles and Dutch. If I don’t we just had a really big dinner. Thanksgiving must not have happened. 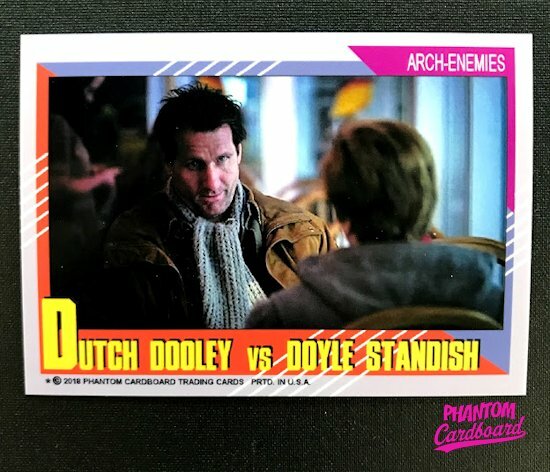 This custom card is a homage to that latter of the two movies, Dutch. Dutch was released in 1991 and like most movies around this time I most likely first saw it on HBO. I loved it the first time I saw it and every time since. For me it’s a perfect holiday movie. Because of Married… With Children I was a big Ed O’Neill fan. The Dutch Dooley character, to me, is only a slightly more refined version of Al Bundy. As the years have gone by I’ve found myself relating somewhere in between the two characters being somewhat of a working stiff from midwest that has had a number of bumps in the road, both self-inflicted and not. Since Dutch was released in 1991 I thought it would be funny to drop Dutch and Dobsy Dale Doyle into a 1991 Impel Marvel Universe Series II ‘Arch-Enemies’ subset inspired design.